Pranaav Jerry Chopra and Sikki Reddy upset fifth seeds Tang/Tse. 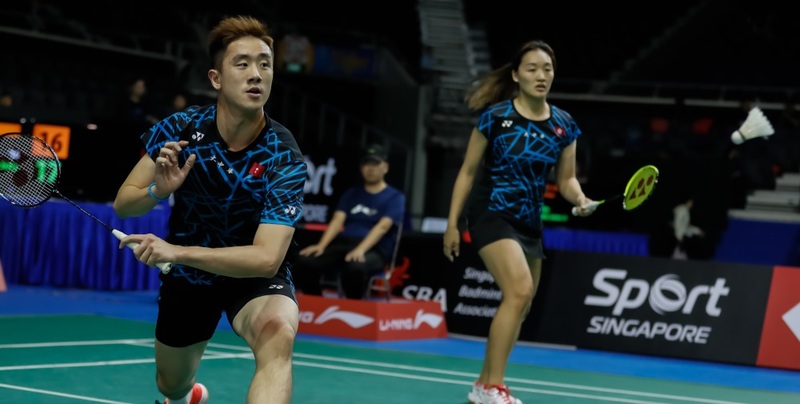 Pranaav Jerry Chopra and Sikki Reddy recovered from a second game hammering to get the better of fifth seeds Tang Chun Man and Tse Ying Suet and entered the mixed doubles quarterfinals of the Singapore Open 2019 today. The Indian duo solved the puzzle of the only dual left-handed pair in the elite ranks, coming away winners at 21-17 6-21 21-19. “We’ve watched them and knew it wasn’t going to be easy as they’re two left-handers, which you never get to play in practice,” said Reddy. Tang Chun Man (left) and Tse Ying Suet of Hong Kong. “It was going to be tricky, but as I’m a lefty, we have a good understanding of that game and knew how to catch them. In the second game we lost the flow because of the drift. We couldn’t understand what was happening. By the time we got the hang of it they had a big lead. So we decided to start afresh and start intercepting more at the net. Tse, coming back from a shoulder injury, said she was still rebuilding her strength. The Hong Kong duo played last week’s Malaysia Open, where they crashed in the first round. In other close matches, Saina Nehwal avenged last week’s Malaysia Open loss to Pornpawee Chochuwong 21-16 18-21 21-19, and young Chinese women’s doubles duo Li Wenmei/Zheng Yu outplayed Korea’s Baek Ha Na/Kim Hye Rin 18-21 21-18 21-17. Kidambi Srikanth recovered from a near-hopeless position in the second game against Hans-Kristian Vittinghus, erasing deficits of 3-12 and 9-17 to get past the Dane, 21-12 23-21. Kidambi’s compatriot Parupalli Kashyap proved a handful for Chen Long, but the fourth-seeded Chinese kept his foot on the pedal to take the match 21-9 15-21 21-16. Li Junhui (right) and Liu Yuchen of China. 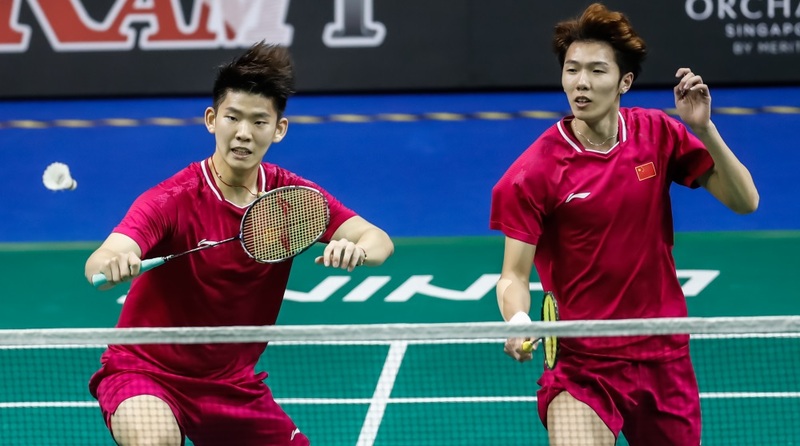 All England men’s doubles runners-up Aaron Chia/Soh Wooi Yik (Malaysia) went down in 30 minutes to second seeds Li Junhui/Liu Yuchen 21-11 21-19. In mixed doubles, Japan’s Yuki Kaneko/Misaki Matsutomo outplayed sixth seeds Goh Soon Huat/Shevon Jemie Lai (Malaysia) 24-22 21-10. However, Matsutomo and Ayaka Takahashi crashed out in women’s doubles to Korea’s Kim Hye Yong/Kong Hee Yong 21-18 21-10. Women’s singles fifth seed Ratchanok Intanon (Thailand) recovered from an opening game loss to get past Han Yue (China), 19-21 21-11 21-13. “This is my fourth time meeting Li Zii Jia, I think we know each other’s weaknesses and strengths. But I am not sure why in the last two matches that I have faced him, it seems he is under a lot of pressure. He is a very good player, he has a very good attack and defence but he made a lot of unforced errors. His spirit has been quite down in the last two matches” – Jonatan Christie, after beating Lee Zii Jia 21-13 21-12.